Over at What Should We Call Swing Dance, someone posted an image macro about how it’s a bit crushing when someone turns down a dance with you and then goes and dances the same song with someone else. There’s a bit of etiquette (which is shared among the partner dances I’m familiar with) that if you turn someone down, you respond as if you didn’t want to dance that song anyway (“I’m tired, I’ll sit this one out”, “I hate Big Bad Voodoo Daddy”) and then sit out for that song, even if you really refused because you don’t particularly want to dance with that person right now. 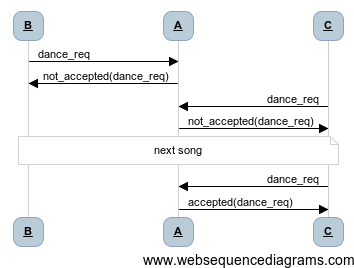 Conversely, if you do go off and dance the song with someone else, it’s a pretty deliberate signal that you don’t want the orignal asker to ask you again, ever ever. (One can also achieve this with the manner of one’s refusal, of course, but this is an advanced skill: Nikolas Lloyd has a training video). It being Tumblr, this meme gets called out as heteronormative (Oh Tumblr! Never change!) because the caller-out is a woman who mostly leads but is in one of those rare scenes where there are too many guys (who also mainly lead), and doesn’t like the implication that it’s rude to turn them down when they ask her to follow. Is there such an implication? Only if the caller-out then goes on to dance that song. The etiquette (and the meme) does not say it’s rude to turn people down. But it does seem like there’s room for some improvement here. 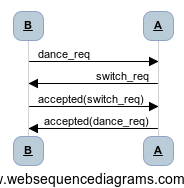 If some people are willing to switch (as we call it in my subculture) but most people have a preferred role, and someone is asked to dance the opposite role to their preference, it seems that one could (a) see whether the asker will dance that role instead, and if not (b) dance with someone who will, with no loss of face for the original asker. I hereby declare that people who do this are Not Rude. There is a further bit of etiquette (not so far referenced in any image macros, as far as I know) which just plain says its rude to turn people down. I agree that this is problematic (as we say on Tumblr). I think it’s usually propagated by dancing teachers in an effort to make dancing more friendly and less cliquey, but you shouldn’t be made to feel guilty for refusing extended physical contact with people you don’t want to have that contact with. The etiquette is exploitable (as we say on 4Chan) by bad actors: see this educational video (Tumblr users: trigger warning for satire). There is a wider question of why it is that men usually lead and women usually follow and whether this is a good thing, but again, Lloyd sorted that out a while ago, so there’s probably no more room for debate about it, I’d’ve thought. How Kerberos works. Via andrewducker.